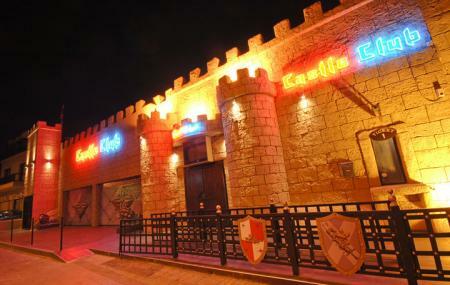 The Castle Club is a premium venue to celebrate your nightlife in Ayia Napa. This nightclub accommodates almost 4000 guests under one roof at one time. The Castle Club entertained the guests in their four separate areas which provide an exclusive ambiance of commercial dance, hip-hop, house-techno-trance and chill out terrace. Added to this, there is a luxury arena too for their VIP guests. Six popular DJs including leading pro DJs boast the club with hilarious music and rhythm. To shake your feet in tune come here with your friends and enjoy a cool night out. The club is open 7 days a week during summer. Remains open up to 05:00 am. Recommended time to visit between 11:00 pm to 01:00 am. How popular is The Castle Club? People normally also visit Ayia Napa Monastary while planning their trip to The Castle Club. For me its a great club. As a non drinker its sodas are a little bit watered down. That aside the layout, staff, music ,ambience and the collections of people make it a fun and beautiful place. Although they pricing pretty high after 11 (not cool at all) , this place is still worth it after 11/12 oclock. Good music, good vibes, a lot of people, maybe they saying they have like 4/5 floors but the dominate 2 floors are the hiphop stage down stairs, and the club stage at the center. And actually thats all you need. The drinks price is a bit above average, but tolerable.